The last clearing sale we went to was the clearing sale to end all clearing sales. We are so overwhelmed with our latest purchase that we haven't been to any others! Not only did we come home with a ute absolutely full of stuff (again..) but this big beauty was delivered to us the very next day. Yes, Marty is on the phone. I think the conversation went something like "Help! We brought a tractor!" This wasn't an impulse purchase at all. We've been considering the need for a tractor.. it's been a tough decision. We were offered to purchase a tractor locally, we also looked at an advertised tractor for sale, but we could see it'd had a hard life. Of course, we've seen them at clearing sales very frequently. This one, I think, was a hidden gem. It's an International A414. It's not a "little grey fergie", so it's not collectable, and it's not fancy, but has enough horsepower to be able to run the few implements we would like to. We spoke to the man who was selling it (ok, yes, it was after we won the auction - but it still counts!) and he confirmed what we could see with our own observations. This was a well looked-after tractor. Bidding was pretty conservative.. Marty didn't even join-in. He waited until the last bid was called ($1800) and simply added $50 to it. I was in knots inside as we waited for the auctioneer to call it. Marty must have been, too, because he said aloud, "Finish it! ", which made the auctioneer and a few others laugh, and stalled things even longer. But thankfully no-one else bid again, and the tractor was ours. The main thing we would like to do with it, initially, is flail-mow the very long dry grass. Since we don't have stock yet, but would like to improve the pasture, flail-mowing is one solution. It's a big mulching mower. Another thing we would like to do is run a PTO driven chipper some day. 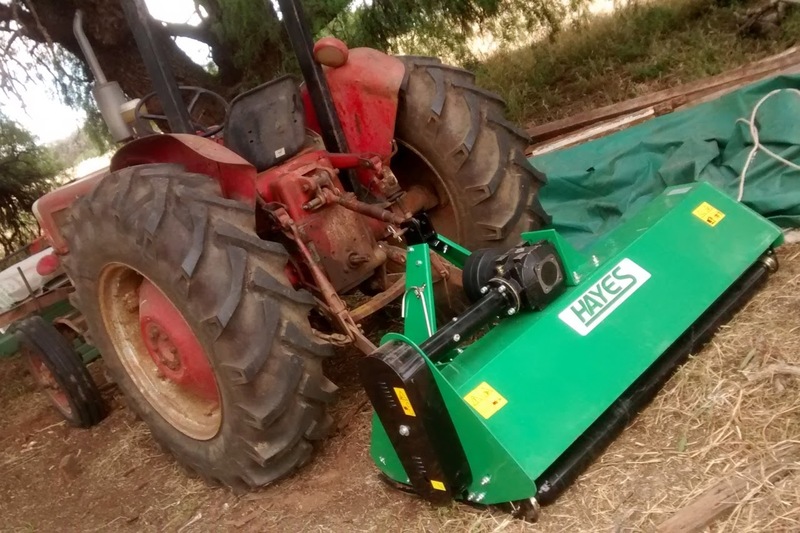 But for now, we have the new flail mower, and that should also help reduce the fuel load in case of fire. It took a bit of effort for two newbies at farming to get to this stage! We havn't even used it yet. 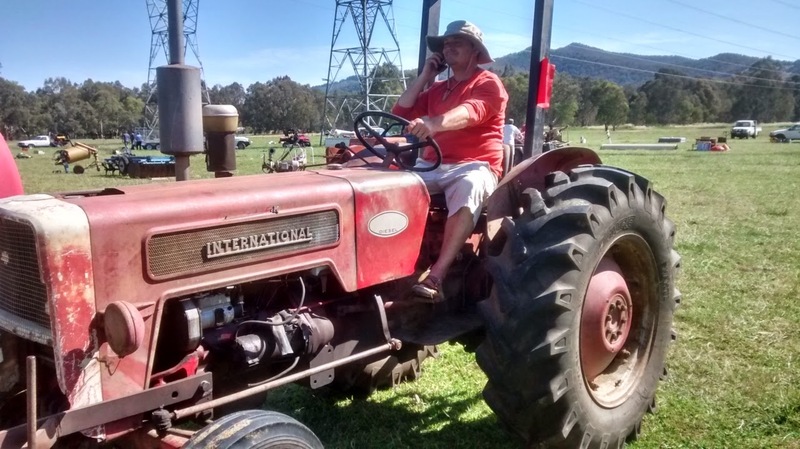 The desire to fix the old girl up (the tractor, that is!) is strong. 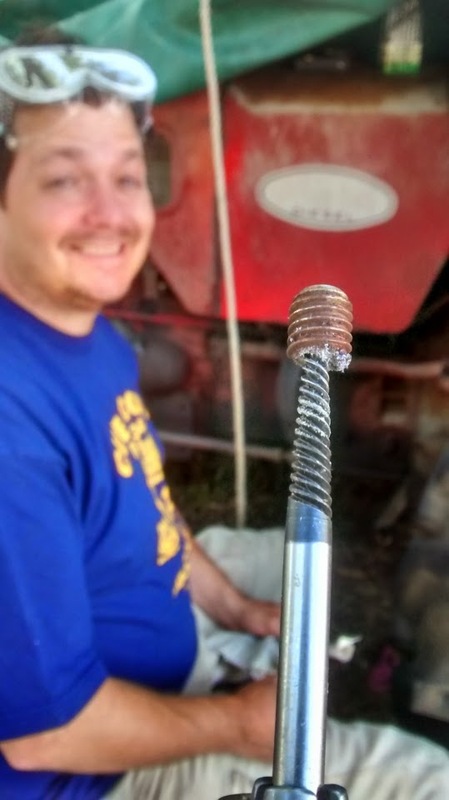 This bolt was snapped off, and Marty got it out and we replaced it, so now the step up to the tractor is a bit more firm. There's a lot more that needs doing, but mostly cosmetic things. The tractor itself runs very nicely (unless we forget to turn on the fuel supply). We're just waiting for the right weather to start mowing now. A nice day after some rain would be lovely, and keep the fire risk lower, as well as the moisture in the ground under the mulch. Hi, I have read your most recent blogs. Verrry interesting. I love the pic of Marty on the tractor. Farmer Marty. I love it!! !